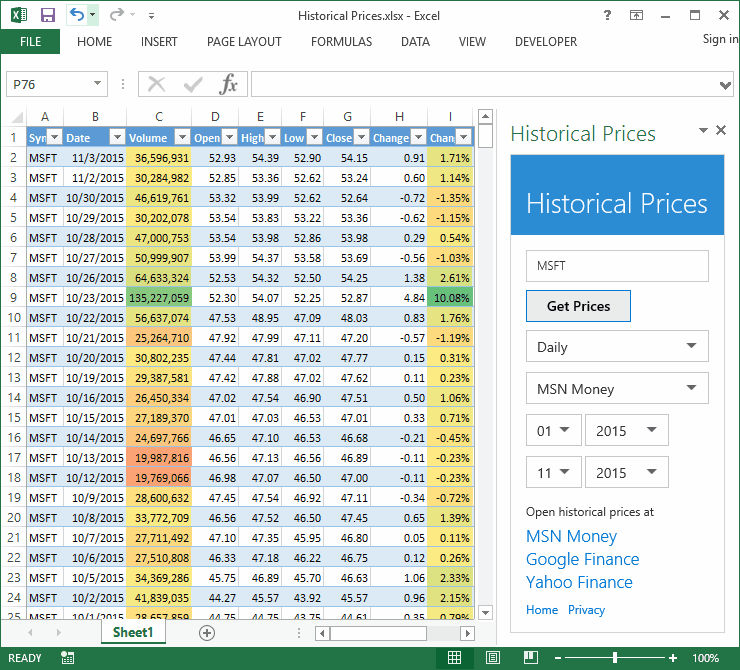 The add-in allows getting daily, weekly and monthly historical prices of US and worldwide stocks and indexes from MSN Money, Yahoo Finance, and Google Finance into Microsoft Excel. The add-in works in Microsoft Excel 2013/2016, Excel Online, and Excel for iPad. Ticker Text Box Specify stock tickers. Get Prices Button Click to insert a new table or to update prices in the current table. Trade Period Combo Box Select a daily, weekly or monthly period. Provider Combo Box Select a provider like MSN Money, Yahoo Finance, or Google Finance. Start Month Combo Box Select a start month. Start Year Combo Box Select a start year. End Month Combo Box Select an end month. End Year Combo Box Select an end year. MSN Money Link Click to open the stock page at MSN Money. Yahoo Finance Link Click to open the stock page at Yahoo Finance. Google Finance Link Click to open the stock page at Google Finance. Home Link Click to open this page. Privacy Link Click to navigate to the privacy statement. Click the My Apps control in the Add-ins group. Select the Historical Prices app. To hide the add-in, close the add-in task pane. Date Trade dates for daily prices or the last dates of weekly and monthly periods. ChangePercent Calculated price change in percent. ShortTermSMA The calculated simple moving average for 50 periods. LongTermSMA The calculated simple moving average for 200 periods. AvgVolume Calculated average trade volume for 50 periods. The add-in loads source data only from the specified provider (MSN Money, Yahoo Finance, or Google Finance). Other services are not used. The data are not cached and updated whenever you click the Get Prices button. The add-in calculates fields described above and may calculate aggregated values if they are absent in a source. MSN Money MSN Money publishes daily history for one year, weekly history for five years, and monthly history for the entire period. Yahoo Finance Yahoo Finance publishes daily, weekly and monthly histories for the entire period. Note that the add-in recalculates the Open, High, Low and Close values using the source Close and Adj Close fields. You may compare results with data from another provider to be sure that the data is correct. Google Finance Google Finance publishes daily history for the entire period. The add-in calculates weekly and monthly histories. The add-in loads data from MSN Money, Yahoo Finance or Google Finance directly. So you have to specify tickers available at the specified data provider. The most of US tickers are the same for all data providers. Tickers for worldwide markets may differ from a provider to provider. For example, Glencore Plc traded at London Stock Exchange has the GLEN ticker at MSN Money, GLEN.L at Yahoo Finance, and GLEN or LON:GLEN at Google Finance. To find a ticker, click on a link of a required provider and find it on a provider website. Then paste it into the ticker text box. Note that you may get historical data for market indexes from Yahoo Finance. For example, use ^GSPC for the S&P 500 Index or ^FTSE for the FTSE 100 Index. You may easily add columns to data tables at the right side or inside the table. You may use formulas. The add-in inserts data in the consistent order, from the newest to the oldest. You may delete source columns. In this case, the add-in does not restore and does not update columns. To restore deleted column, just insert a column and type a column name as it is named in a source data. For example, to restore the price change column, type Change in the column name. You may create multiple tables on a worksheet or on multiple worksheets. The add-in adapts task pane controls to the selected table. The add-in has a particular behavior when you select a new worksheet. It may show values on a task pane for a table on a previously selected worksheet. To update task pane controls, just click on any cell in a table. We hope that our add-in will help you to make trading decisions better and faster. You have 15 days to test the add-in and to make a decision about the purchase. 50 trade dates for daily history. 12 weeks for weekly history. 12 months for monthly history. You may purchase the add-in in the Microsoft Office Store. This is a one-time fee. You will have free updates of the add-in. Feel free to contact us via email at or . The add-in never collects or stores information that can be used to identify you. The add-in never collects or stores information about loaded data and tickers. The add-in makes requests directly to data provider websites or web services using the Yahoo! YQL web service. The add-in makes requests using encrypted HTTPS connections. The add-in is a part of the stock-data-solutions.com website. The Historical Prices add-in loads data from data provider websites or web services directly using the Yahoo! YQL web service. All information provided "as is" for informational purposes only, not intended for trading purposes or advice. Neither Gartle Technology Corporation nor any of independent providers is liable for any informational errors, incompleteness, or delays, or for any actions taken in reliance on information loaded by the add-in. MSN and Microsoft Excel are logos and registered trademarks of Microsoft Corporation. Yahoo Finance is a logo and registered trademark of Yahoo! Inc.
Google Finance is a logo and registered trademark of Google Inc.